A cheap nightclub emcee Joey Evans, what hey use to call "a heel" , ditches his naive girlfriend Linda to romance a rich older woman, Vera Simpson (O'Hara had deliberately given her Vivienne Segal's initials). Vera set him up his own nightclub, and thus exposes herself to a cheap blackmail attempt but one of Joey's former colleagues, dancer Gladys Bumps, and her boyfriend Ludlow Lowell. This fails when Linda warns Vera what they are planning and Vera calls her friend the Police Commissioner; but she decides to kick Joey out anyway. "Brilliant, sardonic and strikingly original...an outstanding triumph...done with such zest and scornful relish that it achieves genuine power." "PAL JOEY still bewitches after all these years"
"PAL JOEY must be everybody's favorite musical." "PAL JOEY is a treasure, with Rodgers & Hart in peak form." "The masterpiece of the long collaboration between composer Richard Rodgers and lyricist Lorenz Hart"
In 1939, while out-of-town with their musical TOO MANY GIRLS, Richard Rodgers and Lorenz Hart received a letter from writer John O'Hara, asking if they would like to write a musical based on his series of short stories written for The New Yorker about a fast-talking Chicago cad whose adventures were told in the form of letters signed "Pal Joey." The idea was provocative and, with an anti-hero at its heartless heart, a challenge to Rodgers & Hart. They quickly said yes. "Not only would the show be totally different from anything we had ever done before," noted Rodgers in his autobiography, MUSICAL STAGES, "it would be different from anything anyone else had ever tried." 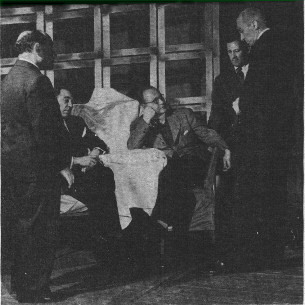 Working closely with George Abbott, who had signed on as the musical's director and producer, O'Hara sculpted a narrative steeped in blackmail, and sexual politics. The central story revolved around Joey and his affair with a worldly-wise society dame, Vera Simpson; Vivienne Segal was cast as Vera (the character, created for the musical, shared Segal's initials) and the title role went to a talented young actor named Gene Kelly. The supporting cast included June Havoc, Van Johnson and Stanley Donen. After a tryout in Philadelphia, PAL JOEY opened at the Ethel Barrymore Theatre on Christmas night, 1940. Evidently, after a day of peace on earth and good will towards men, there wasn't much good will left in the critics for a heel like Joey. In the most famous, and influential, indictment, Brooks Atkinson of the NEW YORK TIMES queried, "Although it is expertly done, can you draw sweet water from a foul well?" PAL JOEY had a Broadway run of less than a year, followed by a three-month, five-city tour. 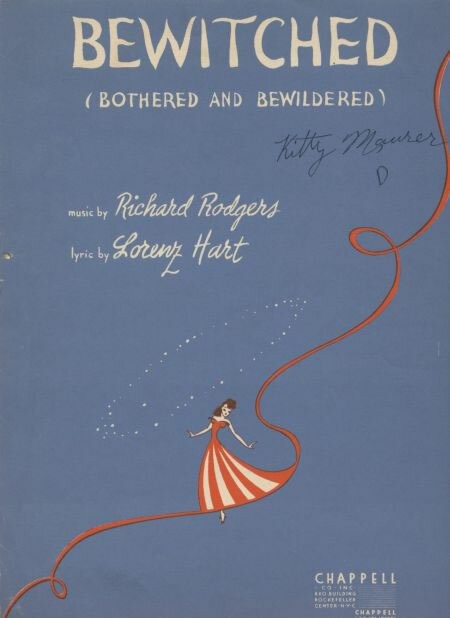 There was surprisingly scant interest in the score, though a few did pick up on "Bewitched, Bothered and Bewildered." Clearly, PAL JOEY was a work ahead of its time. Its time was to come one decade later, and the impetus was "Bewitched." In the spring and summer of 1950, band-leaders and pop singers discovered the song, and before long seven different versions had reached the top of the charts, with five among them making the Top 10. 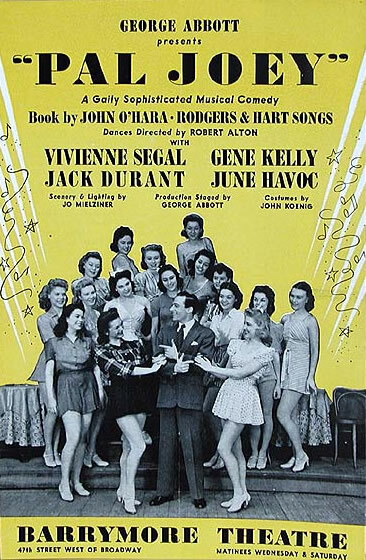 To capitalize on this trend, in September of '50 legendary Columbia Records producer Goddard Lieberson produced a studio cast recording of the entire PAL JOEY score, teaming original star Vivienne Segal with newcomer Harold Lang. The PAL JOEY album proved so popular that a Broadway revival was inevitable, produced by none other than composer Jule Styne, who brought PAL JOEY back to Broadway on January 3, 1952. Born in the twilight of the Rodgers & Hart musical comedy years, PAL JOEY re-emerged twelve years later to a Broadway irrevocably altered by the Rodgers & Hammerstein revolution. Playing at the Broadhurst Theater, PAL JOEY shared 44th Street with SOUTH PACIFIC at the Majestic and THE KING AND I at the St. James, and also shared with those musicals an audience now primed for maturity and depth. This time around, PAL JOEY was a hit. It outran the original by almost half a year, sparked a twelve-city national tour, and received the New York Drama Critics' Circle Award as Best Musical. The London premiere followed in 1954, and the film version, starring Frank Sinatra (a Bowlderized imitation according to fans; "high heresy," according to one critic) was released in 1957. Its classic status assured, PAL JOEY has had many notable productions in the ensuing decades, including three separate revivals at New York's City Center; the first (in '61), starred London's original Vera, Carol Bruce, the second ('63) starred Viveca Lindfors, and both featured the incomparable Bob Fosse as Joey. Also at City Center, a triumphant concert version of PAL JOEY was held during the Hart centennial of 1995 as part of the Encores! series, starring Patti LuPone (Vera), Peter Gallagher (Joey) and Bebe Neuwirth (Melba Snyder) and subsequently recorded by DRG Records. "Larry Hart loved PAL JOEY not only because it was successful and people said good things about his work in it, but because of Joey, himself. Joey is a disreputable character, and Larry understood and liked disreputable characters. He knew what John O'Hara knew -- that Joey was not disreputable because he was mean, but because he had too much imagination to behave himself, and because he was a little weak. If you don't understand this about Joey, you'll probably find him hard to take. If you do understand it, you'll be able to chuckle at him and understand him in more than a superficial sense. Joey as a person met with a great deal of resistance in 1940 when he was first presented to the American public, but I have an idea that this was due largely to the fact that nobody like Joey had ever been on the musical stage before. In the conventional sense, his characteristics were those of a villain, and so long as there was an orchestra in the pit, the villain was supposed to wear a black mustache and be nasty all the way. Since that time, however, characters in musical plays have become more human, and the attitude of the public toward these characters has become more human, too. While Joey himself may have been fairly adolescent in his thinking and his morality, the show bearing his name certainly wore long pants, and in many respects forced the entire musical comedy theater to wear long pants for the first time. We were all pretty proud of this fact."